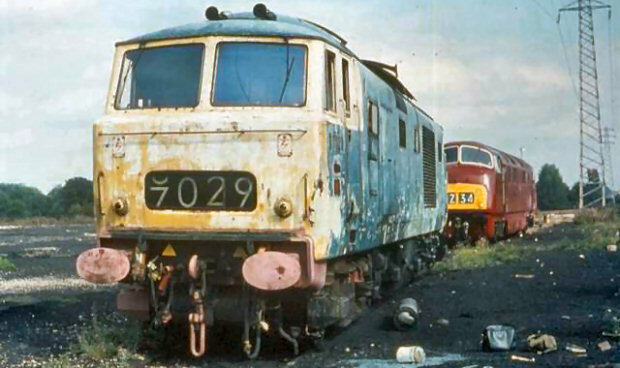 D7029 was sold to us from Old Oak Common for £3,240.00 and it remained there, outside the factory with D7017, until we could find a home. On the 20th October 1975 the Hymek was hauled to Kings Meadow sidings, the former Gas Works, at Reading for restoration to commence. Not the best location for restoration as it was outside with no power supply, water came from the nearby River Thames and the locomotive was subject to attention from local yobs on numerous occasions. Despite these harsh conditions we managed to lift the engine out for repairs and repaint the engine room internally. Eventually a better home was sought and this turned out to be at Swindon Works. 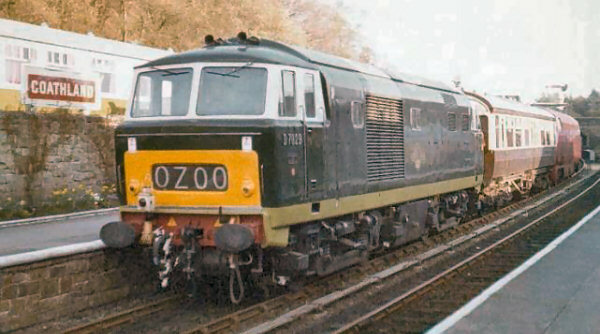 On the 21st February 1977, with the hydraulic era on British Railways drawing to a close the Hymek together with our Warship D821 Greyhound were hauled by a diesel shunter to Reading depot where a Class 31, 31259, took over to haul the duo to Swindon Works for secure accommodation. Here restoration to a higher standard could begin and we always had the intention of operating the Hymek, and accompanying Warship D821 Greyhound, on the main line only. Once the locos were operational it was a game of wait and see what will happen or go to a private line and run the locos. We always had the vision that one day private diesels would return to the main line. Little did we know that for us it would be so long and with a Western! On the 19th May D7029, D821 and D818 Glory were displayed at the Swindon Works open day around the turn table, D7029 had its engine running and D1015 Western Champion sat in the Weigh Shop surrounded by sales stands! The opportunity came to run our two locomotives on a private railway, the North Yorkshire Moors Railway at Grosmont. 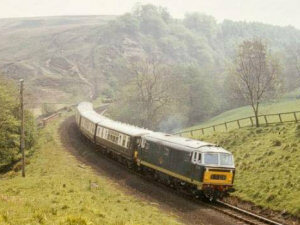 The move to Grosmont took place on the 16th April 1981, again hauled by a Class 31, 31158. The first run in Yorkshire occurred two days later when we operated a loading gauge special with D821 to Pickering and back, a locomotive at either end of the Observation Saloon. Just four days later we had our first incident... we were off the road! We came off in Grosmont head shunt - condition of track - but within a few hours we were back on track! 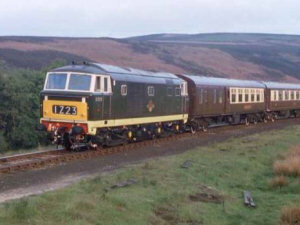 The first run in preservation was a gauging special which ran the whole length of the NYMR with Warship D821 Greyhound. Four days later D7029 suffered an earth fault... the wheels were in the dirt! The first passenger run in preservation took place on the 23rd May 1981 when D7029 worked the 15:00 Grosmont to Pickering service towing a two-car DMU set. A special organised by F&W Railtours on the 10th October 1981 (1Z49 Yorkshire Greyhound) brought us the opportunity to put D7029 and D821, through their paces on a 'proper train'. Whilst the BR coaches off 1Z49 did not come onto the railway (they continued to Whitby with 31207 and 31218) the NYMR 1Z49 was a complete train, loaded full and standing. With D821 Greyhound working from Grosmont to Pickering, D7029 ran ahead light. At Pickering the two locomotives were brought up side by side for photographs and then D7029 hauled the train back, with D821 attached to the back. Sometime between October 1984 and January 1985 steam loco 92134, without its tender, ran cab first into the Hymek, denting the nose end. Despite several lines of enquiry we failed to establish the exact time and culprits of the incident, we just had to pick up the mess! Once the repairs had been completed we set about repainting the locomotive in Green livery again, a task completed at the end of April. The boiler was made operational too and we ran a steam heat test in ... May!! On the 23rd November we had another incident with the Hymek. Whilst performing a simple movement, usually a task put in the capable hands of a driver, Engineer Koch managed to crash the loco through the shed doors in Grosmont shed! Luckily as he is the engineer, he had to fix it! The last working on the NYMR (and indeed up to the present day) was the 23rd July 1987 when D7029 hauled the 19:30 Pickering to Grosmont Pullman train. Since arriving in Yorkshire D7029 operated 20,603 miles, on a line some twenty miles long! On arrival at Grosmont D7029 was stopped, wanting tyre turning and the air reservoirs re-certified. With commitments in getting D1015 running, coupled with the long journey times from our London base to Yorkshire these items did not get done and D7029 was mothballed. Stored up the head shunt at Grosmont it was not until December 1995 that D7029 turned a wheel, when it was hauled to Pickering ready for road movement to the Severn Valley Railway. D7029 arrived at Kidderminster by road on the 26th March 1996 after a two day trip. 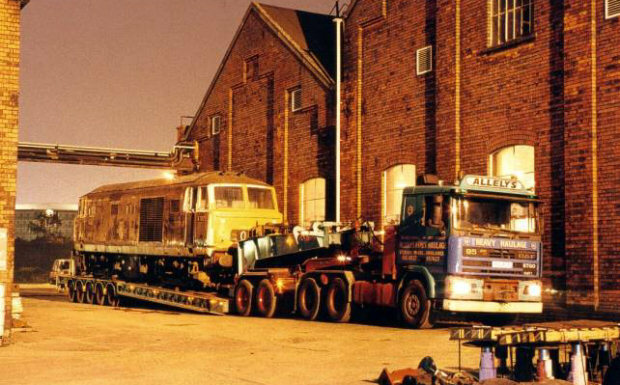 Stored immediately in a siding we approached EWS and secured accommodation at Old Oak Common. Thus, without ever having turned a wheel on the SVR, D7029 left, again by road on the 9th May 2000, to Old Oak Common. At Old Oak Common the boiler water tanks, cooler group, dynostarter, transmission and engine were are lifed from the loco, leaving a very dirty, but empty, shell. More detailed information can be found on the Restoration Works page. • We would have to fit BR AWS to complement TPWS as D7029 never carried BR AWS (in fact no Hymek ever did). • We would have to fit air brake equipment, not in itself a problem, but very expensive to do from scratch (No Hymek was ever air braked). Also we would need vigilance, SSF and NRN radio systems. • Scope for operation will be limited on former BR metals for a 40 year old locomotive pulling 8 coaches around the country taking a considerable amount of time to reach line speed compared with the modern day high speed diesel units. How and where would we get paths? • In order to recoup costs the trains D7029 worked would need to be at least 450 seats or more which would inevitably mean loads of 10 to 12 vehicles, putting more strain on running times for our veteran loco. However, we never say never!